Founded in Brooklyn NY in 1969, Mini-Circuits is a global leader in the design, manufacturing, and distribution of RF, IF, and microwave components and integrated modules. Covering the DC to 50 GHz band for commercial, industrial, space, and military applications, you can find their products being used in WiMax, CATV, Cellular Wireless, RFID, Medical Equipment, Test Equipment, Receivers, Transmitters Aerospace, Mil-Spec and Satellite applications. 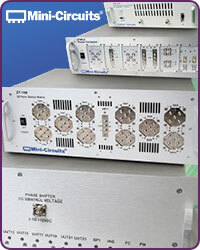 With dozens of product lines representing thousands of off-the-shelf and custom models, Mini-Circuits offers the world's largest variety of signal processing products. If there is a Mini-Circuits product you need that you don't see here in our store, just send us an e-mail or call us at (888) 999-4283 and we'll get it for you!